Just because a news photo makes you feel uncomfortable, does it mean it shouldn’t be published? “EDITORS, TAKE THIS PHOTO DOWN NOW!” posted an online commenter after this image led our home page for most of the day. Earlier, a police scanner call had come into the newsroom saying two people were shot in the Rockwood Cancer Treatment Center at Deaconess Hospital. I ran to my car and arrived at the scene a few minutes later. Emergency personnel scurryed about; ambulances stacked up outside the building. I made as many overall scene shots as I could. I spotted a TV cameraman interviewing two women in a car. As I walked up, S-R reporter Kip Hill joined me. With the TV interview completed, we tried to ask some questions about what happened and were meet by a panicked narrative of shots being fired, of fleeing, of disbelief of what had just occurred so close to them in another room. It was a one-minute interaction as a buildup of vehicles behind their car forcing them to move on. They quickly gave us their names and the passenger confirmed to me she was a cancer patient at the clinic. I shot a dozen or so frames of the women. Soon after, the fire trucks and ambulances left and a press conference was called. It turned out to be a domestic murder-suicide. A man shot and killed his wife who worked in the cancer clinic. So why publish this dramatic photo? Photojournalists sometimes take a lot of heat for the images they make. Capturing fleeting moments of life and people in my community is my job. Most days, my photography is mundane– an environmental portrait of an artist, a shot of a high school basketball game or a slice of life feature picture. Other days, photos, like this one, standout. They can make readers and viewers react negatively because of their shock value. Many times online commenters will use the word “sensationalism” when posting about a photo. So why did we choose this one to publish? Because it best illustrates the shooting aftermath of what happened inside the clinic. 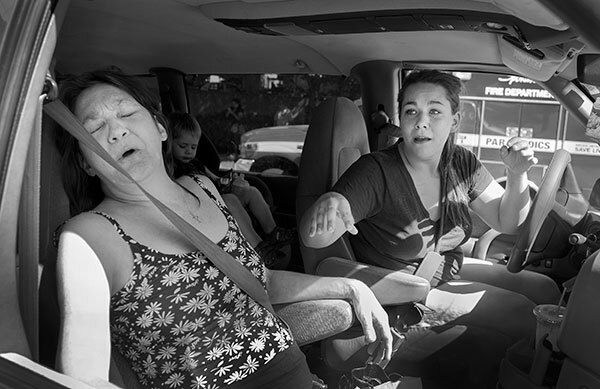 It tells an emotional story without words– the panicked look on the driver’s face, her cancer patient mother in the passenger seat, distraught and uncomfortable. My other frames of police and firemen standing around could not illustrate what happened inside the building. So the editing choice: mundane or more storytelling. Storytelling wins every time, even if it makes you the reader feel someone else’s pain and discomfort. This entry was posted in Editing, Photography, photojournalism and tagged Colin Mulvany, Deaconess, Rockwood Cancer Treatment Center, shooting, Spokane by Colin Mulvany. Bookmark the permalink.